Many of the supplies on the needs lists can be bought locally. The Euro/Pound/Dollar exchange rate is very good in South Africa so you will get more for your money if you purchase any supplies locally. The closest town to Kariega Game Reserve is Kenton-on-Sea which is only 15 minutes drive away. If you would like to take this approach in your supplies, please contact us on jone@kariega.co.za if you need any answers regarding where or what would be best to buy in your situation. Fresh fruit, vegetables and other food stuff can also be bought locally. Kariega Game Reserve has 3 rural communities Ekuphumleni, Marselle and Klipfontein in close proximity to the lodge. These communities have many creches which look after approximately 300 children from new born through 6 years old. Their mothers have to work and the creches create a safe place for the children. But these facilities are very basic and need any help they can recieve for their daily needs. Even a small item goes a long way and will make a positive difference in someone’s life. Kariega Game Reserve has 3 rural communities in close proximity Ekuphumleni, Marselle and Klipfontein. There are four primary schools in these communities serving 1,000 children ages 6 through 11 years old, but no high schools. School learners are always in need of a variety of school supplies and other school items. All of the items listed below will be distributed to the most needy individuals/schools first to make sure everyone has an equal opportunity during their school experience. Even the smallest requested supply will make a huge difference to someone’s life. Kariega Game Reserve has 3 rural communities Ekuphumleni, Marselle and Klipfontein in close proximity to the lodge. The 300 elderly members of the community are mostly left with very little to do and have few items for a comfortable life. They spend much of their time sitting in a shack with just the bare minimum like a mattress and a blanket. These individuals often give their government stipend to their children and they end up sitting in despair. Others are more active and join the craft or other classes presented to them. Whatever the situation might be, any help of supplies will be of great value in making their day a little better and happier. 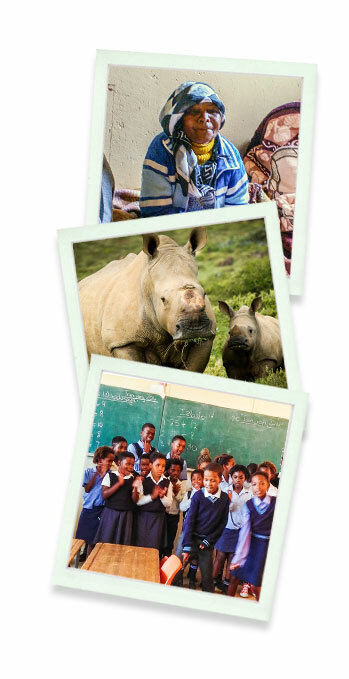 Kariega Game Reserve is passionate about the care and conservation of our wildlife and natural resources. Without these we would not be here and have this amazing opportunity to share it with our wonderful guests from all over the world. We have an active Anti-poaching Unit (APU) which are the guys on the ground doing patrols (day and night) to make sure our wildlife stay safe and out of the hands of poachers. This job is not for the faint-hearted and the unit works very long hours. To make their lives a bit easier and to also make sure they have the equipment they need to do their jobs properly please see the list below. With 3 rural communities right on our doorstep there are hundreds of domestic animals like dogs, cats, pigs and cattle living in these areas as well. Veterinary care is very expensive which discourages the owners to get their animals treated if needed, and some may not know basic care of animals or what diseases to look out for. With the help of our local vet practice, Kenton Veterinary Clinic, we are able to give township animals basic care for a lot less. Receiving items from guests frees up funding to use toward treatments like deworming, dipping, vaccinations, and sterilizations.